- Long term natural pain relief? Su Jok works in the same way as acupuncture but there the similarity ends. The therapy is an easy to apply, fast , natural pain relief system which usually gives relief from the very first session. 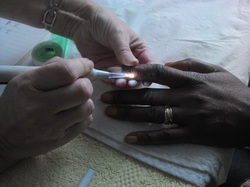 Su Jok Therapy utilises a number of NO NEEDLE options that can be used as an alternative to needles, and the methods of treatment employed are equally as effective as needle application. For clients who prefer traditional needling, we utilise fine micro needles which renders Su Jok therapy adaptable to all individual needs. Su Jok therapy is never applied to the body, the hands and feet are looked at as direct representatives of the body which enables us to successfully treat any area of the body with treatment applied to the hands or feet to bring about FAST relief. N.B.This therapy does not parallel reflexology. Su Jok Therapy is 100% safe with no side effects and the recipient knows immediately whether beneficial change is taking place, which enables the treatment to be adapted if required. Results or Don't Pay - 20 minute treatment. Make an appointment before 20 June. What do you have to lose? ﻿Mr.O.– Sciatica. I had pain in my lower back but far worse was the pain in my calf which made it impossible for me to drive. Pain relief tablets gave little relief. I didn’t know what to expect from Marilyn’s treatment but gave it a go and was very surprised that after one treatment my pain was much reduced and I could walk without limping. I had 4 treatments in all and have been pain free for 2 years. Mrs.H. – Glaucoma. The intra-occular pressure in my eyes was 25, which is dangerous to eyesight and can lead to blindness, the normal reading should be between 12-21max. I had 3 treatments before I saw the doctor at the hospital when it would be decided whether I had to undergo surgery, which I was totally against. Also, the medication I was prescribed made me feel ill. The pressure in my eyes was measured again following the treatments with Marilyn and I was happy to learn had reduced to 15. Mrs N. - Hayfever. For the past 6 weeks I have been taking anti-histamine medication every day, sometimes doubling up, but still suffering with intense itching eyes and streaming nose. Last weekend it seemed the pollen peaked higher, as did my symptoms. My friend's mother Marilyn is a Su Jok practitioner and I called her hoping she could help me. She saw me straight away and applied magnets to my fingers. Within a few minutes the stuffiness in my nose abated and I could breathe easier. After 20 minutes I was symptom free. I have continued to use the magnets as advised and I am medication AND symptom free. This is the 2nd time Marilyn has helped me out in an emergency. Last year I was on holiday in Las Vegas in dreadful pain with an abscess under my tooth. She text a treatment to me and her daughter applied it. I was shocked that as my friend applied pressure to points on my finger the abscess burst in my mouth and I was able to enjoy my holiday.